No film of the decade has made the same impact of James Cameron's Sci-Fi epic Avatar. The movie managed to pull in a massive amount of money (making it one of the highest grossing films ever, inflation pending) and sucked in movie goers. Within a month it became more famous than Titanic. Returning to provide the score came typical James Cameron collaborator James Horner. With Avatar, Horner does revisit some of his original scores (notably the main theme from Titanic) which did stir up some controversy. Plagiarism aside, Avatar is easily one of Horner's best efforts and, in my opinion, his best score of the decade. For this review I will do a track-by-track analysis. ''You Don't Dream In Cryo. ....''- Opening the album is this cue. After starting of with fast paced percussion and ethnic singers, Horner immediately opens on a broad orchestral statement. A dark, metallic theme is used to represent the spaceship in the opening while a soft female vocalist and a trumpet intermix for the opening flashback scenes. As the cue continues a rising and falling theme is used to represent the trip to the planet. The track is broad and emotional. Jake Enters His Avatar World- This cue is seperated into two parts. The first is fully orchestral melody complete with a gradually rising mysterious theme underscored with bass thumping. The second half is tribal, relying more on ethnic percussion and instruments to fully flavor it. It is also the first time the main theme (I See You) is heard. Pure Spirits Of The Forest- Here, Horner really taps into the beautiful images of Pandora by using a more synthetic variation on the main theme giving it a sparkling effect. He also introduces a bold, brassy theme for the Hometree. The Bioluminescence Of The Night- Once again, Horner brings forward the main theme complte with added chimes and piano work. Becoming One Of ''The People''- This track opens with a vocal performance of the main theme before exploding into an orchestral melody. Soon, tribal percussion is added onto the theme. Horner also introduces a sweeping third theme for the Na'Vi. The third part is a small variation on I See You. Climbing Up Iknimaya - The Path To Heaven''- Horner once again introduces a new theme for the Na'Vi, this time being fully performed by vocalists. It sounds impressive with each listen. Jake's First Flight- A number of themes and motifs are combined here to create a massively sweeping enviroment before exploding into the full orchestra performing a falling theme. The track ends off with a single female vocalist. Scorched Earth- Featuring the first action cue of the score, Scorched Earth begins with a slow crescendo before pulling out a despaired version of I See You. Trumpets are also thrown in to increase the intensity. The four note motif from the first track is also heard here combined with tribal singers and percussion. Quaritch- Representing the villain of the film, this cue opens with a dramatic representation of his theme. The rest of the track is mostly dark and emotional until the last minute where the battle chant for the film is introduced. The Destruction Of Hometree- An amalgation of all of the themes from before; Destruction of Hometree is thrilling, dark, and sorrowfull at the same time. The buildup of the cue is incredibly powerful, using orchestrations and impressive choral work while gradually getting faster. When the tree collapses, Horner brings a sorrowful trumpet motif. Shutting Down Grace's Lab- This cue is mostly melodic, with wailing female vocals overscoring the orchestra. Gathering All The Na'vi Clans For Battle- Easily the highlight of Avatar, this cue is very powerful. The heroic theme for the Na'vi is expanded into full orchestral/choral form and takes on several variations. War- War is the longest track on the album, and rightfully so. It opens with a march that is (strikingly similar) to Holst's Mars which segues into the heroic Na'vi theme. As the track continues the battle chant is re-introduced. The last half of the cue opens with a dramatic reprise of the sorrowful melody from Destruction of Hometree before ending off with a broad statement of I See You. I See You- Horner's main song for the film, I See You sounds alot like a reverse engineered version of My Heart Will Go On. Despite being put at the end of the album, the song serves as the basis of the entire soundtrack. Leona Lewis does a great job singing here. Not long after the succesful soundtrack release of Avatar, fans hungered for more. Two bootleg scores, a 3-CD version and a comprehensive 5-CD release, were bootlegged all over the internet. Alot of great music not featured on this particular soundtrack found it's way there, and it really shows that it is a shame that an expanded release doesn't happen anytime soon. 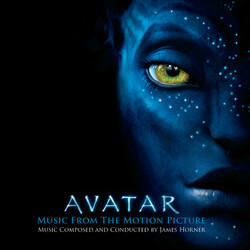 All of that aside, Avatar is one of Horner's better scores. While not wholly original, it does feature some of the best material the composer has put out there. Definitely a must listen. Avatar is a score of which there is much to appreciate and much to overlook if one is to enjoy it as an individual listening experience. The score's much beloved composer James Horner is, needless to say, controversial because of the reuse of his own thematic material, "shameless" mimicry of classical composers and modern composers, alike, etc. - but like many, I am a sucker for his scores and will more than likely always be a faithful fan. I own over 60% of his work, at the very least, and listen to him probably more than any other composer on a regular basis. The reasons for our grievances against Mr. Horner are clear and hard to argue with, but I believe our "likes" far outweigh these general "dislikes". Horner has a way of connecting to his audience. He is a master at creating what I will call "evolutionary melodies" (themes which may change almost completely or morph only slightly from score to score), beautiful chord progressions, and outstanding interpretations and arrangements of his music (if not others, as well). He is a composer that is truly capable of telling a story with his orchestral and electronic palettes in a tasteful and largely appealing manner. His scores rarely become dull, but instead they are quick to fascinate and entertain with majestic beauty, subtle and/or grand themes and beautifully hypnotic rhythms. This soundtrack is no exception. James Horner has created a complete musical world, made up of elements from previous scores (Mighty Joe Young, Glory, Titanic, Apocalypto, the Four Feathers, Troy, etc) He also borrows slightly from Trevor Rabin and Hans Zimmer - strangely enough. The reason I found this so odd is after listening to his interview of which he takes a direct stab to the heart of Remote Control (formerly Media Ventures) he then makes use of elements of their material, namely Remember the Titans by Trevor Rabin (in the beginning snare and string ostinatos of "War"), and a much more significant borrowing of Gladiator by Hans Zimmer in "Gathering all the Na'vi Clans For Battle". All this being said, Avatar, the score album, is still one of my favorites of the year. It is effective, entertaining, original at times, and stunning and majestic in its massive scope. I applaud Mr. Horner, not for a truly fresh effort, but for a solid, dependable listening experience that makes a strong emotional connection with its listener and paints the engaging world of Pandora with so many different sounds and textures that come together so effortlessly. This score is a compilation of sorts, a self salute to his past and hopefully Mr. Horner's continuing future for creating classy, gorgeous, epic scores for today's films.